Offerings 8 is coming on November 16 at “A TD Thanksgiving”! Let’s have a great night of giving offerings of love and thanksgiving to the Lord through art, prose, music, or whatever you’d like to offer. The theme is Engage! and is a call for us to actively engage with our God, with each other, and with life. Take a risk and sign up with Rebecca to share an offering! Here’s a great article to help continue to develop your thoughts on the role of the arts in the Christian life. Andrew Wyeth, one of America’s most renowned realist painters of the twentieth century, had an uncanny ability to capture the solemn nature of the rural American life with painstakingly controlled brushstrokes and a muted color palette. One of Wyeth’s most intriguing and iconic paintings is titled Christina’s World (1948). 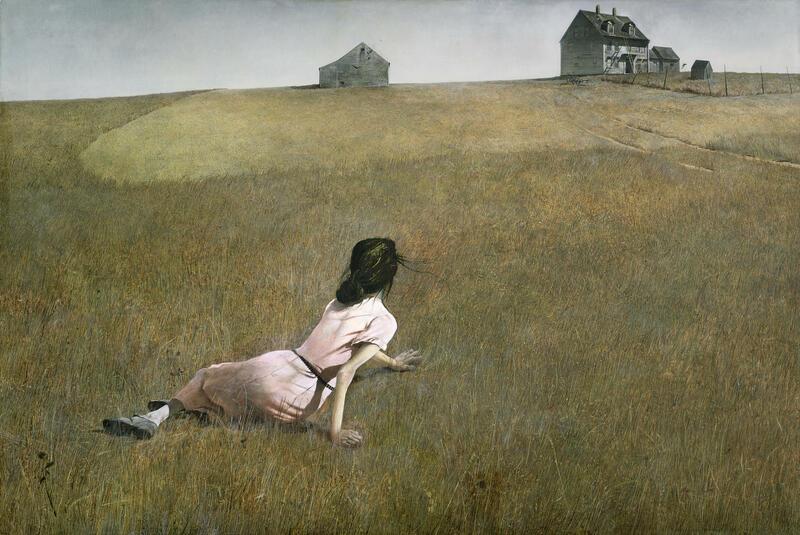 The central focus of the work is a brunette female lying in a field with her left hand struggling toward her far-off farmhouse. The figure in the painting is modeled after Wyeth’s neighbor, Anna Olson. Olson suffered from a degenerative muscular disorder that limited her to crawling around her house and family land. R.C. Sproul’s apt observation of the place of art in the life of a Christian still rings true today: “In the Christian community,” he argued, “there seems to be a negative attitude toward art.” Many believers think that art is unworthy of a Christian, as if art were something worldly, an illegitimate enterprise for Christians to engage in and reflect upon. Yet, as Hans Rookmaker rightly pointed out, art’s justification is found in the way God made the world. To put it plainly, art is its own justification. Why else would it be that humanity alone has been endowed with the ability to appreciate art and experience beauty? Why has God made it so that art like Christina’s World provokes a deep longing that is found in all of us? No living creatures other than human beings would be deeply moved by standing before Wyeth’s painting at the Museum of Modern Art in New York. These reflective questions call for a distinctly Christian answer. What is the deep soul stirring that beautiful art brings to the surface of our conscience? As Christians, we understand that the beginning of art is found in the act of creation in the Genesis account. In creation, God uniquely fashioned human beings in His image as aesthetic creatures possessed with a distinct capacity to experience and appreciate beauty and the ability to cultivate and create beautiful things. The artistic instinct is a universal human phenomenon. Art is embedded in our image-bearing nature. However, the Christian understands that art does not originate from man apart from God. Beauty in art is, therefore, a gift of common grace from God that has been made accessible and comprehensible to all people. For the Christian in particular, art can be experienced as an analogical signpost bearing witness to the Author of all that is beautiful. As human beings, we care about beauty and the arts because our Creator God is beautiful and is the source of all beauty (Pss. 27:4, 50:2). Moreover, in creation, God intentionally fashioned our world as an artist—a divine artist who benevolently chose to endow our earthly experience with beauty (see Rom. 1:20). As an act of self-disclosure, creation itself declares the beauty of God (Ps. 19:1). In the creation of art, the artist mimics the creative work of God in disclosing a particular viewpoint of the world to be apprehended by the viewer. The interaction between the artist and the audience is that of mutual consent. There is something to be communicated, and art is the vehicle of communication. If art truly serves as a signpost, a map, then we as Christians are called to be the guides. Throughout human history, the arts have played a significant role in man’s effort to build a meaningful world. One could argue that the history of civilization can be traced through the arts. Nicholas Wolterstorff argued that the act of creating beautiful things involves the presentation of an alternative world or worldview to be considered by its audience. Implicit in this idea is that beautiful things stand between the artist and the audience and communicate by evoking emotion, conveying truth, and illuminating human experience. The best of art is, among other things, presented for contemplation. Art is a place where meaning can be created, explored, and discovered. At the same time, art is to be discerned. In Acts 17, when Paul was confronted with the idolatrous art of Athens, he became deeply distressed and pointed them to the one true God in whom all of their longings could be met. In examining the things that their artists had created, Paul was able to exegete their culture and uncover the deep desires of their hearts. One principle implicit in this Acts 17 exchange is the truth that art helps cultivate the ability to discern a deeper sense of our human existence and experience. Art allows us to transcend ourselves and see things as they are from different perspectives, thus enabling us to find common ground for interaction. Art, therefore, inclines us to respond more sensitively to the world around us for the purpose of understanding. When specific pieces of art, music, and literature resonate with the masses, it should provoke our attention and study. Even so, art is not exempt from the fall; indeed, it is often an instrument of the falleness of the world. But art can also be an instrument of redemptive dialogue in our world that is fallen yet undergoing cosmic redemption. As Abraham Kuyper reminded us, “in spite of sin by virtue of common grace, [the arts] have continued to shine in human nature, [so] it plainly follows that art can both inspire both believers and unbelievers, and that God remains sovereign to impart it, in his good pleasure.” What we must understand is that the beauties of this world and even the longings expressed in art are a whisper to our souls that there is something beyond the physical order. Therefore, art, like beauty, is both a gift and a map. It is a gift to be enjoyed and a map to be followed back to the source of the beauty with glorious praise. The Christian must appreciate art because it is often the vehicle for which truth, experience, and longings are expressed. Christians must seek to engage in understanding the arts because they provide a window to see how the God-given longings of humanity are expressed from generation to generation. Beautiful pieces of art such as Christina’s World may bring to the surface the shared sense of longing for home that all human beings feel deep within their souls, but the Christian is the one who can point beyond the longing itself toward the God who can fulfill all of these desires in “a better country, that is, a heavenly one” (Heb. 11:16). If art truly serves as a signpost, a map, then we as Christians are called to be the guides. Dr. Matthew Z. Capps is senior pastor of Fairview Baptist Church in Apex, N.C. He is author of Hebrews: A 12 Week Study. Taken from October ’18 issue of Tabletalk magazine, produced by Ligonier Ministries, The Teaching Fellowship of RC Sproul.